Schematic of the learnable permutohedral convolution. Left: splatting the input points (orange) onto the lattice corners (black); Middle: The extent of a filter on the lattice with a 2 neighborhood (white circles), for reference we show a Gaussian filter, with its values color coded. The general case has a free scalar/vector parameter per circle. Right: The result of the convolution at the lattice corners (black) is projected back to the output points (blue). Note that in general the output and input points may be different. In a follow-up work, we showed how one could use Bilateral Neural Networks for fast information propagation across video frames. See the ‘Video Propagation Networks’ website for further details and the corresponding code. We integrated our bilateral filter learning into Caffe neural network framework. Code is available at https://github.com/MPI-IS/bilateralNN. Learnable bilateral convolution layer is implemented as Permutohedral layer in Caffe neural network framework. The format of the filter follows closely the filter format of the standard spatial convolution. It has the shape (n, c, 1, f), with n = num_output, c = input_channels / groups, f = filter_size. Below is a sample prototxt for the layer along with explanations of different parameters of the layer. # with the same features. # permutohedral layer with the same features. num_output: 1              # Number of filter banks == dimension of the output signal. # this many groups to compute the filtered result. # the (num_output / groups) many output groups. # AFTER:                Applies the signal normalization after the filtering. We also add PixelFeature layer in Caffe to extract features from the input image. Following is a sample prototxt to use that layer. This is an example tutorial for using Bilateral Convolution Layers (BCL) as illustrated in Sec. 6.1 of the main paper. This tutorial codes are available in $bilateralNN/bilateralnn_code/examples/tile_segmentation/ folder of the source code repository. To try the example codes, you have to change the CAFFE_ROOT value in config.py file to point to the caffe root directory. A pixel classifier can not distinguish foreground from background since the color is random. We use 3 layered networks for this task. One is CNN with normal spatial convolutions and another one is BNN with learnable bilateral convolutions (BCL). The schematic of these networks is shown below. We use convolutions interleaved with ReLU non-linearities and, intermediate layers have 32 and 16 channels. Three layered CNN (left) and BNN (right) architectures used for segmenting tiles. Conv9 corresponds to 9x9 spatial convolution layer and BCL1 corresponds to 1-neighborhood permutohedral layer. The following is the corresponding deploy prototxt for CNN (cnn_deploy.prototxt) and training prototxt is cnn_train.prototxt. We use 9x9 filters for spatial convolutions. The corresponding deploy prototxt for BNN is shown below (bnn_deploy.prototxt) and training prototxt is bnn_train.prototxt. The features used are RGBXY and the filter has a neighborhood of 1. The total number of parameters in this BNN is around 40K compared to 52K for the above CNN with 9x9 convolutions. num_output: 32              # Number of filter banks == dimension of the output signal. group: 1                    # Number of convolutional groups (default is 1). In this task, color is a discriminative feature for the label and thus doing filtering in high-dimensional RGBXY space would make the task easier. In other words, bilateral convolutions already see the color difference, near-by points are pre-grouped in the permutohedral lattice and the task remains to assign a label to the two groups. Lets see if this is really the case by checking whether BNN converges better than CNN. Training progress in terms of test IoU vs. Iterations. 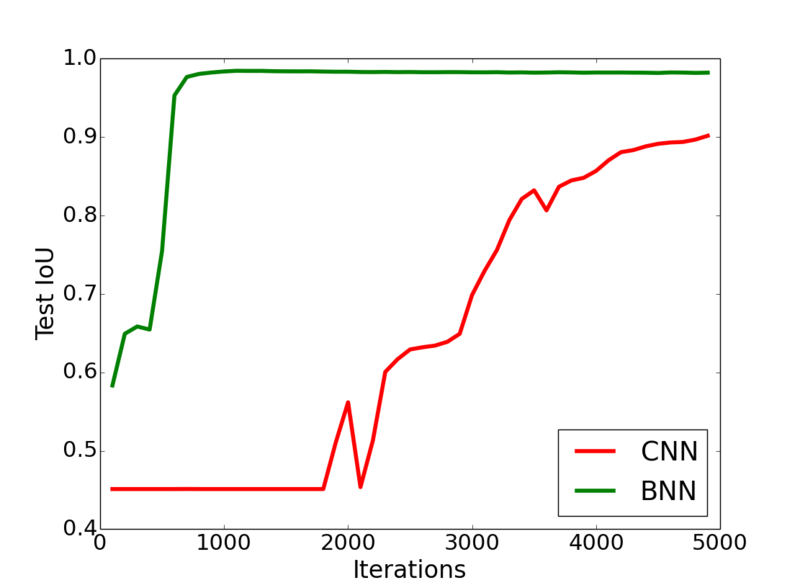 The above plot indicates that BNN has better convergence in comparison to CNN with similar number of parameters. The plots may look slightly different for you due to the random initialization in Caffe. You might have noticed from the training logs that each iteration of BNN is approximately 6-10 times slower (if you use GPU) than CNN. This is due the 5 dimensional filtering in BNN in comparison to 2D filtering in CNN. Some parts of the permutohedral layer uses CPU even when in GPU mode and can be speed up. We observe that CNN can also converge to near-perfect solution when bigger filter sizes are used. Refer to Fig. 5 and Sec. 6.1 of the main paper for more details.